Dave C - Brian Enos's Forums... Maku mozo! He's back shooting again and he is still very good......... There are still no sights on at least one of his 1911s. I have found that if you just center up the front sight and center up the rear sight, the gun will shoot pretty darn good. Without anything to back up my claim, they are reference markings for windage adjustments. Yep same for me. No issues with the CMC XP mags. 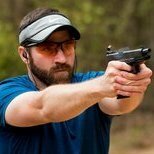 How-to on installing LPA rear sights? 1. Press down on the sight leaf to relieve the elevation spring pressure. 2. Rotate the elevation screw counter clockwise until it comes out of the sight body. 3. Lift up on the sight leaf being careful not to loose the springs that are underneath it. 4. Locate the allen screw or screws holding the sight body to the slide. 5. Remove the the allen screw/screws 6. Center the sight body in the slide. 7. Reinstall the allen screw/screws in the sight body. Use loctite on the screws and snug them down. 8. Install the springs under the sight leaf. 9. Press down on the sight leaf and install the elevation screw back to the same height it was prior. replace M&P sights -- DIY or gunsmith? Different part numbers at Dawson's so I would bet the answer is no they do not interchange. I have installed many Dawson sights on M&P full size, Pro and Shield handguns. Just always ordered the sight specified by Dawson and never tried to interchange. The Dawson rear sights come in 2 different notch widths. Check out their website for exact measurements. On your M&P, they were Smith and Wesson sights (some of the older M&P Pros had Novak stamped on the rear sight). As TK66 said check out Dawson Precision. Specifically look at the competition sights sets for your model of Glock. If you liked the S&W sights on your Pro, you will really like what Dawson has to offer. 1911 9mm 10 Round Magazines - Bullets Hard to Thumb Out? Because the 9mm is a tapered round, the rim of the case gets hung up in the extractor groove on the round below it in the single stack magazine. Watch what is happening when you try to thumb the round out of the magazine and you will see the second round in the magazine also trying to move forward than stopping when the nose of the bullet comes in contact with the inside of the magazine. The 40 and the 45 are straight walled cases so the issue is almost nonexistent in those single stack magazines. Bottom line is....if you want to shoot single stack 9mm, you have to accept the fact that the magazines are more difficult to unload and figure the best way for you to overcome the situation. Depends on the gun and the magazines. Some combinations have no issues at all while others simply refuse to seat when fully loaded. I have been accused of removing about 1/2 a coil from the magazine springs in Wilson and CM magazines. Not admitting to anything, but both sets of mags worked just fine ever since............. Never had that issue with Tripp 9mm mags. Racknrider is correct about a .180 being pretty much standard. On some guns, a .180 height front sight requires that you crank up the rear sight pretty high to achieve desired point of impact. If you are hitting the desired point with a .160 height front sight (and you have an adjustable rear) then may want to replace your current sight with a .160.